It was a bittersweet night. The sensations I felt, the sounds filling the air, the smells of fragrance mixed with blood and fear. I could see the terror in her eyes yet she laughed gleefully at my feeble attempts. I tried to cut her deeper and harder, yet every time she just laughed, ever louder and louder. I wanted to yell at her, “Shut up!” but my voice had vanished so I decided to pull her hair out. I kept ripping and tugging yet the laughing would not stop. I could see droplets of blood forming on her scalp and bits of flesh being pulled away as I ripped and tugged until there was nothing left. That’s when she went quiet. I walked around to the front of her and stared at her face as the little streams of blood started flowing down, dripping from her chin onto her bare chest. She looked beautiful. Her eyes closed, her head tilted down, her skin shimmering with the dark blood in the dull light. Then I decided to cut her loose from the chair. I started with her legs. The ties holding her down had cut into her skin. It was bruised and bleeding as she’d struggled to free herself. By the time I managed to cut all her ties I realised that the pliers kept slipping around in my hands. 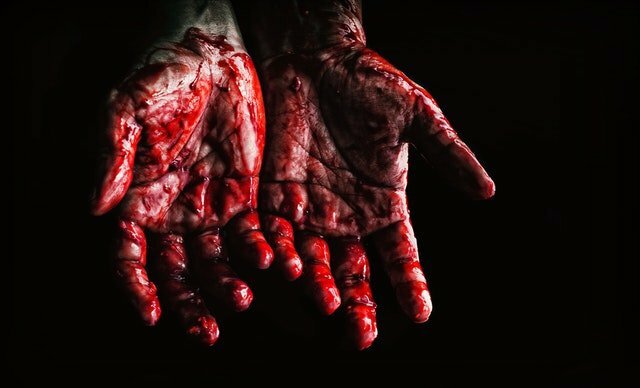 My blood soaked hands. I looked at her again. This time it felt different. I felt a sensation of relief. A sensation of peace. She finally seemed at peace. Then, my nightmare started again. She lifted her head and laughed at me. I grabbed her around the throat and stabbed at her abdomen with the pliers. I stabbed and stabbed yet she laughed, uncontrollably, incessantly at my feeble attempts. Then, finally, I woke up. It was but a dream. My vest was damp from the sweat and I could feel my clammy pillow cooling the back of my neck. Yet, I just lay there, staring at the ceiling in the dark of the night with but one thought on my mind. Thank you for reading and let me know if you enjoy horror stories. Should I continue down this path? Awesome! As long as I've sent a little chill up your spine and built some suspense I've accomplished my goal. Thank you for the support :) Much appreciated! Jusi beware, hide all possible weapons! I love scary stories @therneau, very well written! I'm going to have to @lizelle. Very proud of this piece of writing of his and I'm very happy that it was so well received. Haha, yeah, indeed @lizelle. I'm glad you enjoy scary stories :) I wasn't quite sure what the general reaction would be since I think it's a fairly limited audience. Guess it's all good though and I'm glad you enjoyed it. Creepy, twisted, dark but very gripping. Good stuff @therneau! Thanks @gholsa. Much appreciated the support :) Let's see what else the dairy may bring forth. So freaking creepy. Impressive writing @therneau and I will now be hiding the pliers and other sharp objects away. Powerful psychosis here. A riveting read. Well done!